Two boxes were filled with donations from the Comfort Closet Drive on January 11th. The Comfort Closet, which was once just an idea by educators, has recently become a community-wide program, and even fellow Slicers are getting in action, keeping the closet full of necessities. 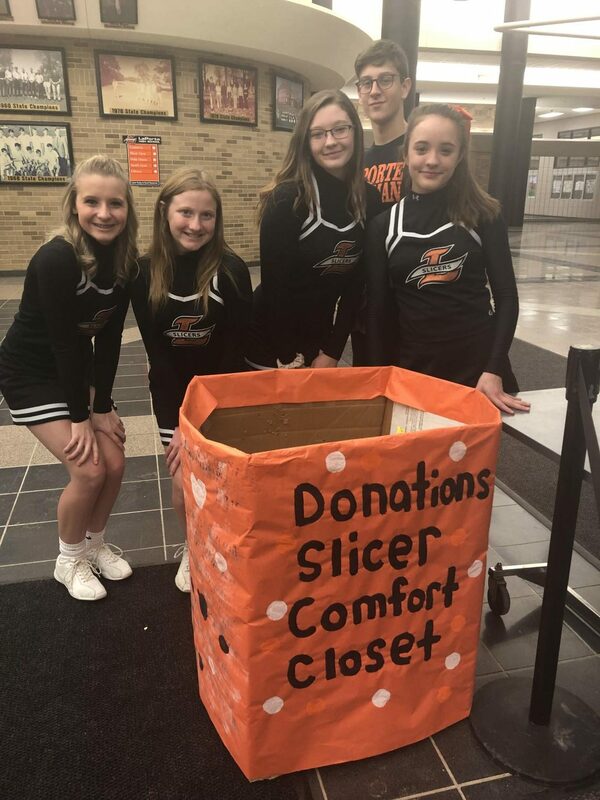 On January 11th, the cheerleaders led a drive to keep the closet full by asking spectators of the boy/girl double header basketball game to bring a donation to add to the Comfort Closet, with those who donate receiving a free Slicer t-shirt. Because of all of the donations, the Comfort Closet doesn’t have to worry about running out of supply for the rest of the semester. In fact, the sponsors have already filled two cabinets, and they are in the process of getting extra shelving units to hold all the items. “We ran out of shirts midway through the boys’ game! It was amazing,” Coach Lidgard, cheer head coach, said. LPHS cheerleads helped fill the Comfort Closet during the January 11th double header. 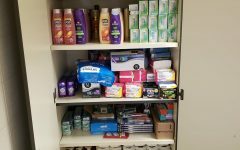 The Comfort Closet is a cabinet full of health and hygiene products that students may not be able to afford or have access to. The closet has shampoo, conditioner, toothpaste, toilet paper, lotion, face wash, deodorant, floss, pads, tampons, etc. The Comfort Closet originally started after LPHS staff members saw the idea on social media and realized how much of an impact it could potentially make on the LPHS students. Caryn Schmidt, Kate Steinhubel, Amy Jackson, Jessica Aguilar, and Kate Henderson are the Slicer educators who took the risk and applied for the La Porte Education Foundation mini grant, and they were awarded $500. The Comfort Closet opened at the beginning of the school year with the help of the grant money. Word about the project quickly spread throughout La Porte, and community members and business jumped on the chance to help Slicers by frequently donating items to keep the closet stocked. All that the students in need of health and hygiene products have to do is go online to their Canvas SRT page and fill out a form. The request is 100% anonymous, which makes people feel comfortable with asking for themselves or others. The information shared–whether students nominate themselves or get nominated by someone else–is confidential. Those in charge of the closet will put the items together for the students, who will receive their requested items quickly. The Comfort Closet has filled over 100 requests, but it wouldn’t have been possible without the teachers who once only had an idea. 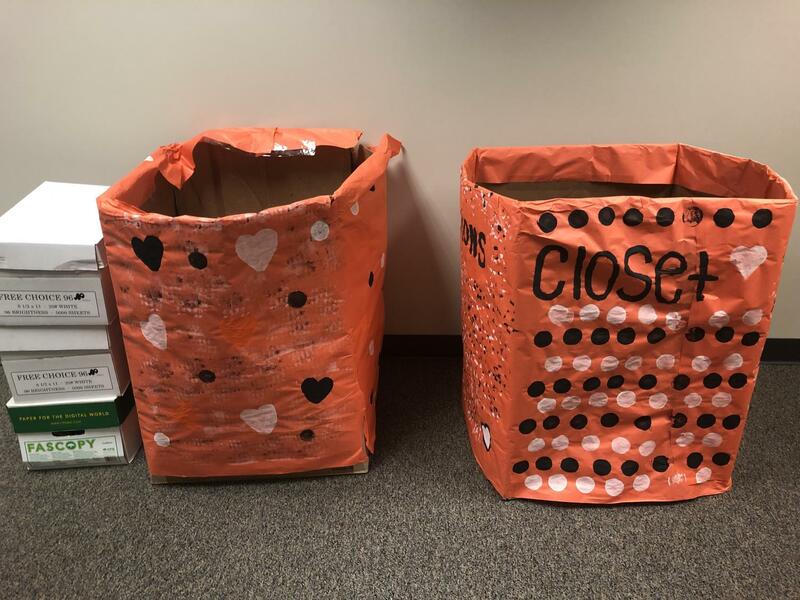 The Comfort Closet will still be accepting donations for the rest of the school year, and anyone willing to donate can contact Amy Jackson at [email protected] or Caryn Schmidt at [email protected].